‘I think Passau is a very family-friendly town’: Mindy Nunez Duffourc lived in Passau from October 2016 to March 2019 to conduct comparative research on medical malpractice law at the Chair of Common Law, which is held by Professor Jörg Fedtke. 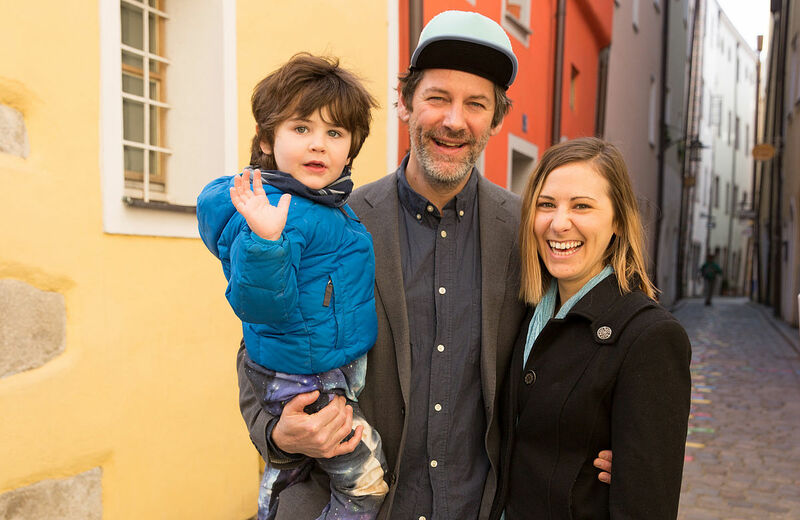 In October 2016, Mindy Nunez Duffourc moved to Passau from New Orleans, bringing along her husband René and son Rainier. She took time out from her career as a lawyer when she was awarded a one-year German Chancellor Fellowship from the Alexander von Humboldt Foundation and became a member of Professor Jörg Fedtke's team at the Chair of Common Law of the University of Passau. Mindy stayed until March 2019 and is now going to return to her position as a lawyer in New Orleans. She said that the support infrastructure of the University, especially the services of the Welcome Centre, have made it easy for her and her family to arrive and feel at home. Her husband, an artist, painted in a small art studio in the Höllgasse, one of Passau’s most picturesque alleys that is famous for its colourful cobblestones. It can be seen in the background of the video interview with Mindy. You stayed here longer than expected. Why? I came as a Bundeskanzler-Stipendiatin of the Alexander von Humboldt-Stiftung and through that programme I was able to design my own research project. It was going to last for one year. Professor Fedtke at the Chair of Common Law very graciously hosted me here in Passau. One day, we were having coffee and were talking about my research and he suggested that I turn it into a PhD project and offered me a job at the University teaching in its comparative law studies programme. So, I submitted my PhD proposal and it was accepted by the Dean and – I stayed longer! My dissertation takes a comparative approach to defining a legal cause of action for organisational risk management in healthcare. My basic question is: Do healthcare organisations have a legal duty to manage risks that might injure patients? When we talk about medical errors generally, we usually think about the individual provider, the doctor or the nurse. But in modern error prevention, research tells us that we should also look at the organisation. My dissertation is trying to align the medical malpractice law with this organisational focus. How did you and your family experience Passau? I think Passau is a very family-friendly town. Some Germans may think that it’s far away from the big cities. But for us Americans, it’s actually very close to Munich and even to Vienna. So, we had the benefit of being in a smaller, family-friendly place where we can walk, there’s lots of Spielplätze (playgrounds) for my son, and the Kita – the nursery school – was at the University campus. That was a great resource for us. If we wanted to travel, we just walked to the Bahnhof (station), get on the train – and we could really go almost anywhere. So we took advantage of living in this beautiful baroque town. What are you going to miss about Passau? The first thing we’ll miss is not needing a car. Here, we can walk everywhere and we live near the Old Town, which has been really nice. We have a Spielplatz for my son to play almost everywhere we go. There’s one right along the Inn and the one on the Ortsspitze has been nice. We enjoyed taking strolls along the rivers, the Danube and the Inn, and especially our morning commute along the Inn to the University and to my son’s Kita has been really amazing especially in contrast to driving-a-car-every-morning in the U.S.
What are you going to do back in New Orleans? I’m actually returning to the practice of law, which will be interesting because the month that I’ll get back I already have two oral arguments in front of the U.S. 5th Circuit Court of Appeal. So I really am just going to hit the ground running on practising. But I also will continue with my comparative research and looking to Germany when it comes to inspiration for the U.S. system, maybe to find better ways to approach error prevention or influence the approach to medical malpractice law. I will, of course, have to finish my dissertation, I will be continuing that research and I’m presenting at the annual meeting of the Law and Society Association in Washington D.C. My topic is actually: ‘How can we learn from the German model to improve patient support after a medical error?’ I will continue to have that German influence in my work and I’m going to go back to practising law.